Deep down in the slow-motion world of the sea, kelp sways rhythmically and schools of fish glide forward, propelled by the sweeping movement of their tails. This scene may capture the hearts of ocean lovers, but to engineers familiar with biomimicry (a new discipline that uses nature’s best ideas to solve human problems) these natural processes can help inspire the design of innovative, sustainable machines. This includes the cutting-edge energy harvesting devices currently being piloted in Tasmania by BioPower Systems, an Australian company founded by Timothy Finnigan. Ocean power generally falls into two broad categories: tidal or wave. 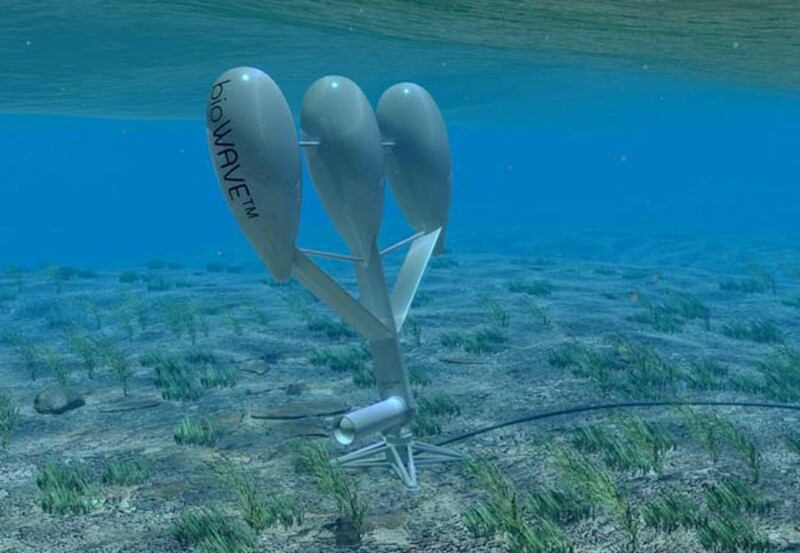 Unlike most other companies seeking to tap the sea’s potential, BioPower is developing both sectors through two units: first, bioWAVE, which transforms wave energy into electricity. The 90-ton, 100-foot-high-by-100-foot-wide assembly was conceived to imitate kelp fronds — not so much in appearance but in its movement, oscillating back and forth to capture natural wave action. And because the unit rotates freely, it automatically orients itself to waves for maximum output. The second is the bioSTREAM, which weighs slightly less and uses ocean tides to produce electricity. It too oscillates, though its tail-like design is based on species like shark, tuna or mackerel. “These fish have evolved exceptionally efficient mechanisms for translating body energy into forward thrust at about 90 percent efficiency,” said Finnigan. But instead of having the entire device move through the water, the patented fin-like unit swings like a weathervane to convert the propulsive force of tidal currents into energy. Even the method of tethering these units is nature-inspired. The bioBASE mounting system employs multiple root-like anchors in much the same way large sea plants stay connected to the sea floor, a design which helps distribute load forces. And since the base is interchangeable, the units can be installed quickly and removed easily for repair and maintenance, reducing costs. Moreover, the natural design helps protect against the ravages of powerful storms. “If it was rigid like an oak tree,” Finnigan said, “and a big wave came, it could snap off.” The bioWAVE, in contrast, automatically lays itself flat on the seabed when seas get too rough. Electricity is brought onshore through a single cable to a transformer station that’s connected to the distribution grid. Initially, each system will deliver 250 kilowatts of power. However, for the upcoming commercial release (bioSTREAM this fall, bioWAVE during early 2010) the design will be scaled up to 1 megawatt, enough to power up to 800 homes annually. By 2015, Finnigan hopes to deploy bioWAVE and bioSTREAM in multiples, much like wind farms, first to five and ultimately 50 two-megawatt units providing a total of 100 MW. While BioPower Systems is unique in its use of biomimicry, capturing the power of the sea is nothing new. In colonial New England, mills relied on ocean tides to turn waterwheels connected to grindstones. And centuries earlier, it was discovered, mills powered by tidal energy were used along the coast of Brittany, France. However, it wasn’t until 1966 that the first modern commercial tidal power plant was built on the Rance River estuary near St. Malo, France. Comprised of a “barrage” — essentially a huge dam — the 240-MW system resides on the surface of the water and uses the ebb and flow of tides to turn turbines connected to generators. Last September, a Scottish company, Pelamis Wave Power, initiated the world’s first wave-energy farm off the coast of Portugal. Comprised of three semi-submerged tube-like structures 140 meters long and 3.5 meters in diameter, the “wave snake” employs wave energy to pump high-pressure fluid through hydraulic motors, which drive electrical generators to produce a little more than 2 MW of electricity. In the U.S., the industry is concentrated in Northern California and Oregon, though some systems have been installed on the East Coast. 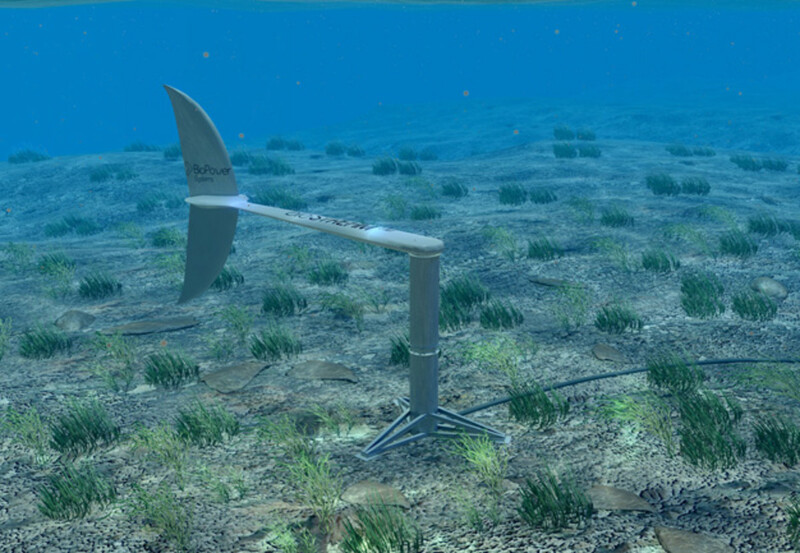 Last month, Ocean Power Technologies, which operates in Spain, Hawaii and New Jersey, teamed up with Lockheed Martin Corp. to build a wave farm off the West Coast. Most experts, Englander included, believe ocean power is where wind power was 15 or 20 years ago. Finnigan, though, expects the learning curve to compress this time. “We can draw on all the advanced composites, the power conversion equipment, the computer systems and deployment methods wind already uses,” he insists. Other challenges include environmental concerns such as interference with fish and migratory patterns and resistance from commercial fisherman, who view these machines as disruptive. There are also technical hurdles. For example, Verdant Power’s tidal energy system in New York’s East River suffered a big setback in 2006 when blades from its tidal turbines broke off. And in 2007, Finavera’s prototype AquaBuOY wave-power machine sank off the Oregon coast. One big advantage ocean power has over wind and solar is its reliability. Winds can be erratic and the sun’s energy can be obscured by clouds and diminished by latitude and seasonal variations. However, since tides are driven by the moon, they’re not only consistent but predictable over years. The size and energy content of waves can be forecast three to five days in advance. This is one reason analysts like Englander expect the market to expand from fewer than 10 MW today to more than 500 MW by 2015. Of course, no one can predict the success of one company, but Englander is optimistic about BioPower Systems. “The fact that they’re piloting the thing is really significant. One issue I discuss in the report is how companies like BioPower signal a shift away from cobbling together pieces from boats and offshore oil rigs into developing pure-play ocean power technologies. That’s an important evolution in and of itself,” and one that manages to connect ancient existence with state-of-the-art technology. Indeed, backed up by millions of years of field-testing, who better than nature to teach us how to make our tools function efficiently?